Bernheim Forest - KENTUCKY WOMANS MISSIONARY UNION, INC. Girls will learn about God’s ecosystem in Bernheim Forest. They’ll explore trails, enjoy the education center, and challenge their climbing skills at the natural playground. Girls will discover ways to take care of God’s earth and how that can be used to share the Good News of Jesus. A missionary will join us for this exploration. Bring your lunch and hiking shoes and join us for this eco-friendly, missions-friendly day! Register HERE for GA Day at Bernheim Forest! 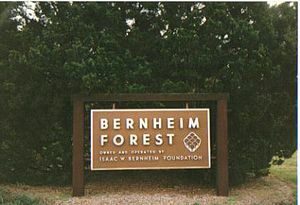 Bernheim Forest is located at 2075 Clermont Rd. in Clermont, near Bardstown. Our day begins at 10:00 am. We will meet at the Education Center. Our day ends at 3:00 pm. Excitement for missions and God’s creation!